The Center for Literacy developed and piloted a parent engagement program for kindergartners in the Twinsburg City School District during winter and spring of 2016 with support from Summit Education Initiative. The goal of this parent engagement program was to increase parent awareness and support of student literacy development at home and to reduce the number of children in need of a Reading Improvement Plan (RIMP) across Summit County. Student outcomes from our 2015-2016 pilot were quite promising. The effects of family engagement on simple word decoding and sight word recognition were significant, regardless of a student’s initial levels of literacy development. This initial pilot study showed that students whose families engaged fully in the project gained an additional 27% on their spring MAP test scores, compared with students whose families did not participate. As a result of the outcomes in 2016, Key Steps to Reading Success was piloted for a second year in five school districts (nine total elementary schools) in Summit County. The results were once again significant. At this time, Key Steps to Reading Success is implemented with families in over 30 schools in Summit County. Approximately 1,400 families are using this program with their kindergarten children. For more information on becoming part of Key Steps to Reading Success, please contact Dr. Shelley Houser at shouser@uakron.edu or Dr. Matthew Deevers at mdeevers@seisummit.org. In the Akron Public School District, Forest Hill Elementary parents who are primarily English Language Learners come to school early with their children (before the school day begins) to learn how to read the books used in Key Steps to Reading Success with their children. Dr. Shelley Houser is seen in this picture modeling not only reading for the parents, but how they can play literacy games with their children. 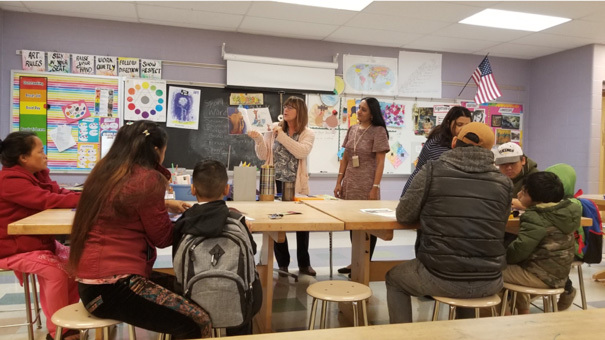 Mrs. Laxmi Chari, Assistant Principal and Mrs. Pabitra Dhimal (interpreter) assist Dr. Houser in helping parents when they have questions about the activities.